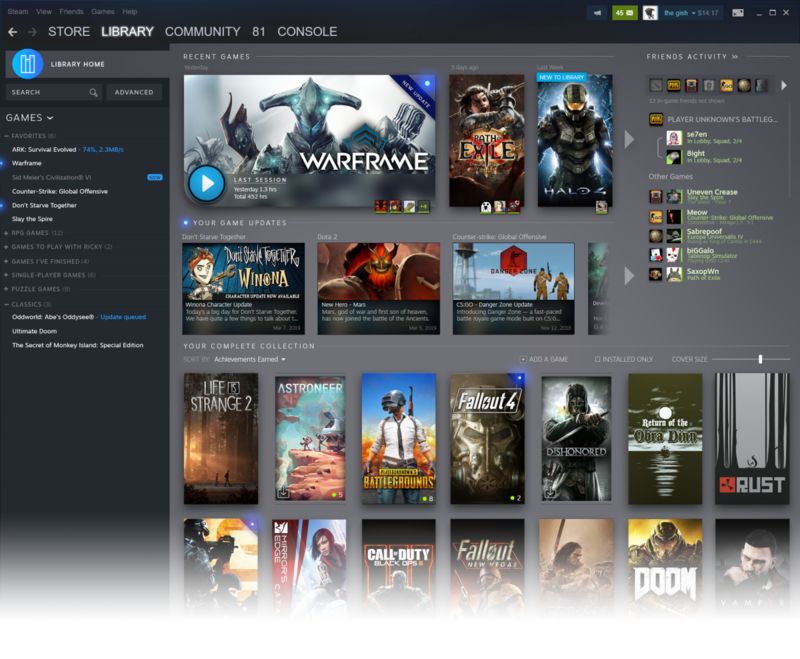 After years of rumors and leaked mockup images, it's finally happening: Steam's library is getting a new look. This is not a full-on redesign of Steam in its entirety, so the store and other parts of the interface aren't changing as far as we know. In its keynote at GDC on Thursday, Valve showed off the new library view, highlighting a redesigned page with large game thumbnails and more categorization around what's going on with your games. homepage, "said Valve's Alden Kroll. "This is an opportunity for players to see what else is happening in the games that I play?" "
The biggest new feature for the library, at least in terms of functionality, is an extension of the tags Steam has been using on the store for several years. Those tags now carry over to the library page, and you can perform advanced searches using several tags to drill down through your games. The cool addition is that you can save a tag as a "collection" or similar games, like, say, "Ninja Action." The library detail page for individual games (see image below) has also been reworked, with a cleaner layout prioritizing recent updates or livestreams for the game at the top of the page. Below is an activity feed with recent actions from your friends list. The right-hand friends list carries over but will highlight any friends currently active in that game at the moment. Below your friends list are DLC, achievements, trading cards, and screenshots. Valve didn't announce a release date for the new library view, but it was about emailing that it's aiming for a beta release this summer. The newest news follows the recent launch of Steam Link Anywhere for on-the-go streaming and Valve opening up the Steam network infrastructure it uses for CS: GO and Dota to all games on the platform. As part of its talk on Thursday, the company also showed off a new page on Steam for promoting in-game events. Read more about it here. The new game detail page.